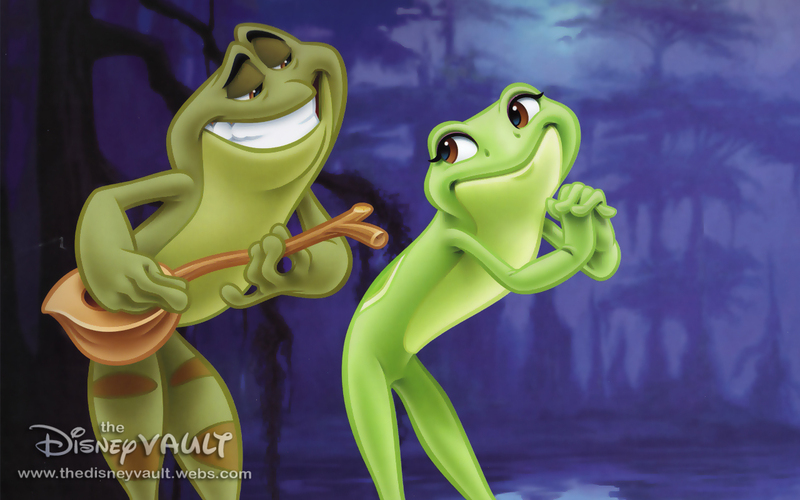 The Princess & the Frog is the first Disney film with an African American Princess. The film takes place in New Orleans, Louisiana. This inspirational story is about girl names Tiana who who believes in working hard to achieve her dreams. She has a seamstress mother (who works for a wealthy white man , Mr La Bouff and his daughter Charlotte) and father who works very hard for his family with the dream to be a chef where his family will open a restaurant where "all walks of life"will come to eat. With voodoo and the Shadow Man, this story transforms into Tiana meeting her "Frog Prince"and going on an adventure with an talking Aligator who plays the trumpet and a Firefly who helps them along the way. In the beginning of the film, you see Charlotte and Tiana sitting in Charlotte's room listening to Tiana's mom telling the story of The Frog Princess while sewing a dress for Charlotte. You can see that in the beginning Charlotte's room is quite big a colorful (and so is her dress). Tiana and her mom, Eudora, are wearing the same dark green color. It signifies the differences in the lifestyles each Tiana and Charlotte live and their race. Charlotte's dad comes in as Tiana and Eudora are leaving, and asks Eudora to sew her a dress like the princess in the book (in hopes to become a princess one day). "We see the shadow of Big Daddy sternly telling Charlotte that he will no longer be a pushover — and then, in a baby-talk voice, asking, “Now who wants a puppy?”"(The Oberlin Review).This specific scene I believe is showing some form of white privilege by the way Charlotte and Mr. La Bouff acts. Charlotte is given whatever is asked of her father and Tiana views this as she walks out of Charlotte's room. I thought it was interesting to see that Tiana lives in an all black neighborhood. The color contrast between Charlotte's house and clothing and Tiana's clothing, neighborhood and home is different. Charlotte's home/clothing is colorful and big, Tiana's is dark and her and her neighbor's blothing are dark tones as well. When children view this, this has a negative affect on their view on white and colored people. It gives the messages that white people are "rich", "colorful" and therefore, "interesting" . That colored people are "poor", "dressed badly" and "not as interesting". Another thing I noticed was that all of the African American people look alike. They have the same features like noses, lips, eyes and hair. This is a stereotype of African American people for children to see. I also thought this scene was interesting. This is at the beginning when Prince Naveen arives into New Orleans. His valet, Lawrence, is a white man. Later in the movie, you learn that Lawrence lives a poor life and provides for the rest of his family. Another thing interesting about this scene is that he has white women swooning over him (this could also be because he is a prince). In different parts of the movie also (in the restaurant Tiana works in and at Charlotte's party there are different races of people). Once Tiana reaches her amount to buy her restaurant, these two brother realtors (Mr. and Mr. Fenner) sell her the restaurant. Tiana then see's them at Charlotte's party for Prince Naveen. She talks about her excitement for the new restaurant and they tell her "You were outbid by a man. A woman of your backround would have had your hands full." This is creating a stereotype for women and African and American women. Their blatantly calling her out on the fact that she wouldn't have been able to handle to the restaurant, the work, or the money. This scene is very offensive. At this point in the film, the Shadow Man has turned Prince Naveen into a frog. He finds Tiana, mistakes her for a Princess and asks her for a kiss. Tiana becomes as frog too and so starts their journy in the Bayou where they meet Lewis an aligator that plays the trumpet and a firelfy names ray. In an article about the stereotypes in this film, the Oberlin Review talks about how Ray signifies what it's like to live in rural Louisiana and that anyone colored who lives there is poor (Ray's accent and that he's missing teeth). We then run into another steroptype, Hillbillies. Along their adventure in the Bayou, the frogs run into 3 men who are frog hunting. The hillbillies aren't wearing shoes, all are wearing overalls, have guns, beards, southern accents, and are missing teeth. They also seem very dim and not very smart. After they travel on a Ferry boat back to New Orleans and the Shadow Man tricks Tiana and Prince Naveen. They realize that what they needed was love and choose to stay together even though they are both frogs. They end up getting married as frogs by Mama Odie and then turn back into human. It's a happy ever after and Tiana then gets her restaurant. But I noticed that when Tiana pays for her restaurant with her savings, Prince Naveen is with her. This to me, shows that only once when Tiana was married to a man (and a man of power at that) they finally give her the restaurant. 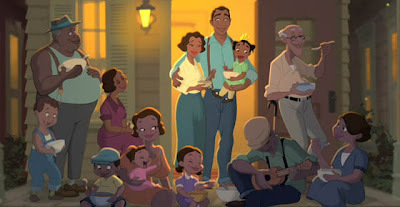 You can also tell at the end of the film that Prince Naveen and Tiana are of different races and thus, this is the first interracial marrige with Disney. This film has good messages and disturbing views that our children could see. 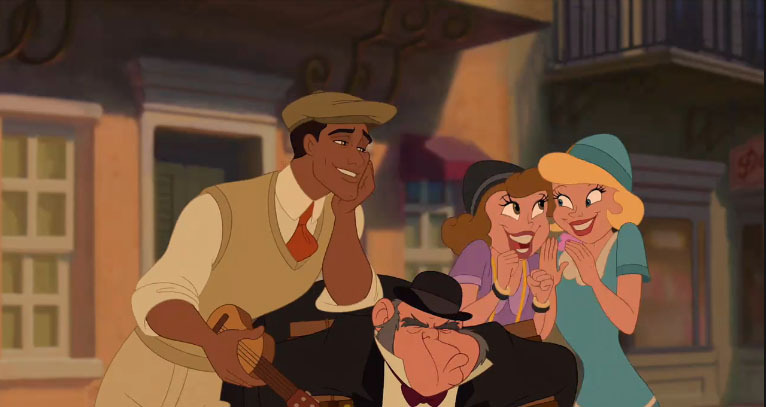 I think the good messages are that there are differenet Racial views of people such as Prince Naveen and his Valet Lawrence, and that there are a mix of different ethnicities in the restaurant and at Charlotte's party. Children could easily see that the bad ideas are White Privelege (Charlotte and Mr. La Bouff, when he gets the parade king because he has a lot of money), the color contrast between the white people and colored people, and what the realtors say to Tiana about having her hands full. Some parts are apparopriate and some parts aren't. I am a little torn about how I feel after watching this film, but some of the messages are ispiring for children. No matter what, race shouldn't justify what you get out of life, it should be the way you treat other people and how hard you work to achieve your dreams. I felt a little torn over this movie as well. On one hand, I liked that there was an African American princess finally. But on the other hand, she did seem fairly stereotypical. Now that I think about it though, all of the Disney princesses seem stereotypical. They are trying to be diverse, but they are all the same body size and they all have some what similar features. 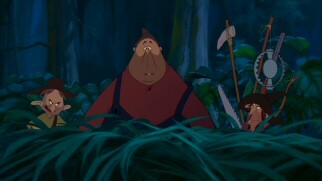 It seems like they did the tourist approach to the Disney movies. This film is Disney trying to get it right....they made some wonderful strides when comparing this to their previous films.